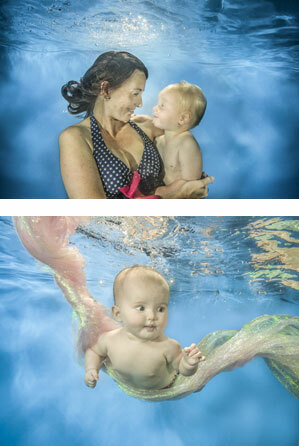 You may have heard about underwater baby or child Photography, giving you amazing portraits of your baby or child. Everything is designed to be as similar as possible to your usual lesson. Your normal swim teacher will act as baby handler on the shoot and there will be a maximum of five babies in the water during your 30 minute session. This gives your baby or child a break between dips and allows your baby or child to feel relaxed while maintaining interest and enthusiasm. You are welcomed into the water by a meet and greeter then your shoot starts with a light warm up, including a short dip underwater. Throughout we make sure your baby or child is as relaxed and happy as possible. Zac chats with you and shows you the shots in progress throughout your session, working closely with you to get the shots you really want. This helps with the inclusivity of the day and the progression of each shot. Have a look at some of the previous portraits here, and, if you like what you see, use the site to book before the sessions fill up. For safety every child must be accompanied by an adult who must be in the water with them at all times. You can buy as many or as few images as you want (from 0 to as many as you want). You pay just £40.00 per baby or child for your session, and then you can choose (there's no obligation) to buy a personal image gallery of digital portraits of your baby or child. The shoot is very competitively priced - especially considering that Zac is one of only a very few full-time professional underwater photographers, in the UK and Europe much in demand by advertising agencies, image libraries and magazines. He has won three international awards in his field. If you have a sibling, you simply pay £40 per sibling to attend the shoot. If you are 100% happy with the images of your children you can buy your own personal image gallery of the images you like. We try to run on time and keep your 30 minute sessions punctual, but sometimes when babies are mixed with water the minutes may well drift a little. Please be patient, as when its your turn you will see for yourself what we mean. Zac shoots all the sessions personally and normally expects to shoot each baby or child about 3-5 times underwater during your 30 minute session and during each dip take between 2-8 shots. This gives you about 10-30 shots to start with. This is possible through both experience and the high quality of the camera and lighting systems Zac uses. This is a happy by-product of owning really top specification equipment already, which he uses on his natural history and advertising underwater assignments. This is too often not the case with other underwater photography companies. Important: The highly trained baby handler on the day will decide how many dips the baby is capable of doing. It might be less or might be more than 3-5 dips. This depends on the health and happiness of baby on the day. You get 30 minutes of Zac's time in the pool and hours of it during the retouching stage. Zac won't let a single image leave his desk until he is sure it is as perfect as it can be. Your baby or child should have attended one but preferably two terms of six weeks with your swim school. This is needed to build up the skills, strength and stamina needed to get best results from the photo shoot. In essence your baby will need the ability to do a minimum of 4, 2 second free submersions in 30 minutes. Your baby must wear aqua nappies under a swimming costume or overs, and please remember to tuck the nappy liners under the swimming overs. First go to the 'book your shoot' page where you will find a full list of shoot sessions. Next select the time which suits you best. You can add a sibling at this stage too for the same time. Finally add your own password and check out. What if I need to change my booking to another time or venue after I have booked? Thats fine all you do is let us know by email - info@littledolphinimages.com or phone - 01273 566 292 as soon as possible and we can do that for you as long as there is free space on that shoot. What if my child is sick on the day? Just let us know as soon as possible and we will send you a voucher to book onto the next shoot free of charge. We can't send you a voucher or give you a re shoot if you book on and don't arrive for your shoot and / or don't tell us until after your shoot. I'm sure you will understand. See more on the 'Prices and products' page.